Ultratec’s patents relate to systems for facilitating phone calls for deaf people. In eight parallel IPR proceedings, the PTAB found the challenged claims anticipated and/or obvious. On appeal, the Federal Circuit has vacated – holding that “the Board failed to consider material evidence and failed to explain its decisions to exclude the evidence.” As you might expect, the panel of Judges Newman, Linn, and Moore held the PTAB’s feet to the fire. Ultratec sued CaptionCall … for infringement [and] the jury found the patents valid and infringed and awarded damages of $44.1 million. Five months after the verdict, the Board issued final written decisions holding all challenged claims of Ultratec’s patents were either anticipated or would have been obvious. The district court subsequently stayed all post-judgment proceedings pending final resolution of the IPRs. The particular issue here involves the patent challenger CaptionCall’s expert witness Benedict Occhiogrosso who provided testimony both for the court proceedings and for the IPR. One week after the court trial, the patentee Ultratech attempted to introduce Occhiogrosso’s trial testimony into the IPR proceedings to show conflicts between the two – but the PTAB repeatedly blocked that attempt without ever reviewing the trial testimony. Ultimately, the PTAB issued a final decision crediting Occhiogrosso’s credibility for its final conclusion of unpatentaiblity. When the patentee first attempted to introduce the original trial testimony, its request was denied because Ultratech had not followed the rules of first requesting authorization to file a such motion. 37 C.F.R. § 42.123(b). Subsequently, Ultratech did request authorization, but that request was denied (orally) without the Board ever reviewing the conflicting testimony since, under PTAB rules, the request may not include information related to the supplementary evidence. The PTO solicitor’s office then refused to include the full documentation regarding these submissions in the ‘official’ record submitted to the Federal Circuit. This record affords but one reasonable conclusion: Ultratec satisfied both of § 42.123(b)’s requirements for allowing Ultratec to file a motion to admit Mr. Occhiogrosso’s trial testimony. First, the evidence could not have been obtained earlier. Ultratec emailed the Board requesting authorization to file a motion to supplement the record the week after the jury trial concluded. This is not evidence that could have been located earlier through a more diligent or exhaustive search; it did not exist during the IPR discovery period. . . . The Board offers no reasoned basis why it would not be in the interest of justice to consider sworn inconsistent testimony on the identical issue. . . . Ultratec sought to offer recent sworn testimony of the same expert addressing the same patents, references, and limitations at issue in the IPRs. A reasonable adjudicator would have wanted to review this evidence. If Mr. Occhiogrosso gave conflicting testimony on cross-examination, this would be highly relevant to both the Board’s analysis of the specific issues on which he gave inconsistent testimony and to the Board’s overall view of his credibility. Mr. Occhiogrosso’s testimony was critical to the Board’s fact findings in this case, as the opinions’ repeated reliance on it establishes. Under such circumstances, no reasonable fact finder would refuse to consider evidence of inconsistent sworn testimony. Moreover, any such inconsistencies would likely bear on the overall credibility of the expert. . . . Admitting and reviewing Mr. Occhiogrosso’s trial testimony would have placed minimal additional burden on the Board. The second problem is that “the Board’s procedures allowed it to make significant evidentiary decisions without providing an explanation or a reasoned basis for its decisions.” This violates general principles of administrative law. On remand, the Board shall admit and consider Mr. Occhiogrosso’s trial testimony. If the Board finds he gave inconsistent testimony, the Board shall consider the impact on the specific patents at issue in the trial testimony as well as on his credibility as a whole. U.S. Patent Nos. 5,909,482 (“the ’482 patent”), 6,233,314 (“the ’314 patent”), 6,594,346 (“the ’346 patent”), 6,603,835 (“the ’835 patent”), 7,003,082 (“the ’082 patent”), 7,319,740 (“the ’740 patent”), 7,555,104 (“the ’104 patent”), and 8,213,578 (“the ’578 patent”). Somehow “anon” is able to convince himself that Interviews at the PTO between Examiners and Applicants are just like the negotiations he had with his parole officer. Go figure. Junky patent claims, after all, don’t impact anybody’s rights at all. And at the same time this very deep thinker is somehow able to convince himself that everything else that happens at the PTO that isn’t recorded is “Star Chamber” activity (LOL) that must be whined about incessantly (because otherwise how he will accumulate the funds to move out of Mom’s basement — he’s very very poor, you know! Just an unlucky impoverished soul living at the margins of society). Fell free to abstain from the ad hominem and actually provide SOME backing for your rather bold statement. You kind of forgot about doing that in your hurry to be a schmuck. Excellent use of the Catch 22 cover art. Well to all you whom have been critical of my view of PTAB as a “Star Chamber” as being harsh. I stand corrected, it is an Decision First – Evidence later Queen of Hearts, procedural ‘Court’ as well as a Star Chamber. This is an extraordinarily important procedural opinion. 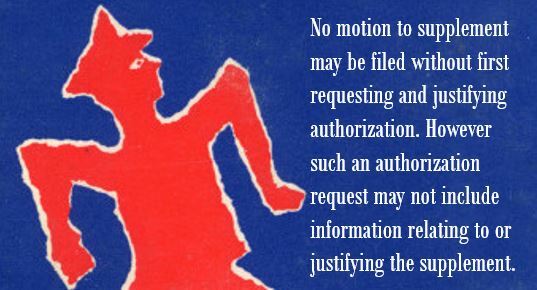 So many motions are denied at the “request to file a motion” stage, and the PTAB does not adequately explain its reasoning, and it does not provide the parties sufficient opportunity to be heard. More often than not, the PTAB administrative patent judges base their decisions on workload considerations. Unfortunately, although the Federal Circuit identifies problems with various PTAB rules and procedures, the Court did not expressly hold that those rules must be revised. And maybe we’re seeing the foundation being laid for one of the most basic and glaring problems in the PTO right now: unrecorded Interviews between Examiners and Applicants. There is no excuse for it and there is no way you can complain about the PTAB’s relatively miniscule number of omissions in this regard with the enormous level of completely unrecorded and substantial exchanges taking place between Examiners and Applicants every day. Although Judge Newman tends to heavily side with patentees, Judges Moore and Linn tend to be more strongly focused on procedure. I can certainly see them having a problem with interviews whose substance is not recorded. It’s an issue that has been percolating upwards for a long time. What else has been percolating upwards for a long time. Is to get a complete record of what Lee did for Google while at USPTO and the complete record of every conversation / email Lee had with the infringement lobby. MM The google paid blogger will not ask for that will he ? Very very serious stuff. I love the focus, Brian! I’m sure your relentless obsession with excessive corporate power and wealth/power distribution bleeds into other political contexts as well. [L]et’s look at real wages measured in 2016 dollars. From 1920 to the early 1970s, real wages rise quickly and consistently. But in the mid-1970s real wages begin to decline. Then in the mid-1990s wages begin to slowly rise. The S&P, on the other hand, behaves quite differently. From the 1920s to the early 1970s it also moves upward, but slowly. Then the S&P rapidly shoots up just as wages begin to decline. Surely the answer is more patents for rich entitled whiners and the fabulous attorneys who “monetize” them. What has that got to do with your focus on supporting and advancing google agenda ? and getting paid to do it ? Right. And when you stopped beating your wife (remind everyone when that was), you started abusing your children. And the police came knocking and you tried to blame Google. It’s deep, deep serious stuff. An oft-old tale. You can get help. Ask “anon”. He tried. What innuendo are you trying to peddle now? Surely the answer is to make all patent system invalid so Google and the big companies can have more money. Sure MM that would help your employer and 99.99 % of the American people who don’t work for google apple amazon facebook ..
we know who you want to see benefit. Monday morning job for you . log on at 10:00 AM from silicon valley and start talking about invalidating all the patents for big companies in the disguise of helping the poor mom and pop .. Your comment at the end seems to indicate that you might have wished that the CAFC order the PTAB to revise their procedures to comport with the APA….however, does the CAFC actually have the AUTHORITY to order this remedy on the PTO? The court has power to answer questions correctly asked of it. Responses are limited. You must ask the right questions. If only we could get a complete record of what Lee did for Google while at USPTO and the complete record of every conversation / email Lee had with the infringement lobby. Keep it up Brian. For too long, Night Writer has gone uncontested as Patently O’s worst commentator. It’s good of you to make some sport for him. Though copying his style so directly is unlikely to earn you the title. Ben : Who are you getting paid from : Lee or Google ? or are you part of the kangaroo court ? Not even remotely close to being accurate, Ben. Malcolm claims that record – and there is no one to compare to as to being in second, third, fourth or even fifth place behind him. Keep it up Brian. For too long, Night Writer has gone uncontested as Patently O’s worst commentator. Let’s be perfectly clear on that point. Starting with all past discussions and moving forward in dealing with the content and form of examiner interviews with applicants that are in the form of negotiations. Then realize exactly why negotiations are treated as they are – ACROSS the legal spectrum – and realize exactly why Malcolm has whined as he has in the past – and why he is attempting to obfuscate here and now with his “broadening” comment. But hey, Dan H, haven’t heard from you in awhile. How have you been? Good. Busy, but good. Thanks for asking! Awesome. And trends are indicating that things will only be getting better. trends are indicating that things will only be getting better. That’s been true since Obama took office. My comment has ZERO to do with presidential politics. But there must have been plenty of substantive patent law in that comment to escape our esteemed Mr. Morgan’s sensitivities. MM, the calls where I participated, the PTAB noted that we could have a court reporter. The PTAB provides a court reporter just once, at the main hearing. If a call is not recorded, the party not recording it bears some of the fault. Perhaps in the future, people will be allowed to simply record the calls, distribute the recording it to every party and file it as part of the record. Actually, the PTAB should do this.